One of our big concerns about using energy and in particular wasting energy is when we see people sitting in their cars. They are waiting for someone idling their car. This is such a huge waste of energy. With the price of gasoline going up so much we thought it was time to write a post about this very common occurrence, idling your car. Perhaps a few people will read this post and think twice about idling their car again and maybe even save themselves some money as well as help the environment. There is a time and a place for idling your car. For example, if you live in a cold climate, you need to have your car warmed up so that the windshield is not covered with frost and so that you can see. If you are pulling a heavy trailer, you want to give your car’s engine a chance to warm up before placing it under a heavy load. Starting from a cold start and flooring the gas pedal on a cold engine is never a good thing to do, since not all of the engine parts are up to operating temperature. We decided to list some of the issues and reasons why you need to warm up an engine, but not let an engine idle for any length of time. If you agree or disagree or have other ideas about engine idling, please leave your comments at the end of this post. New electric cars and the Toyota Prius solve this problem of idling since the engine is shut off while stopped at stop signs and at the curb. Traditional powered vehicles still have this issue and we could all reduce our cost as well as pollution by allowing our vehicles to idle less. Driving Warms the Car Faster than Idling. If your concern is not the health of the car, but simply your own creature comforts, it warms up faster if you just drive it since the engine is under load and working harder than it would while idling. Ten Seconds Is All You Need. After about ten seconds, you waste more money running the engine than restarting it. Switch the car off at the curb and you’ll be leaving money in your wallet and protecting the air in your community. If you live in a cold climate, obviously it will take longer for the car to warm up and clear the windshield of frost, however once it is warmed up there is no need to keep it running while waiting at the curb. Idling forces an engine to operate in a very inefficient and gasoline-rich mode that, over time, can degrade the engine’s performance and reduce mileage. 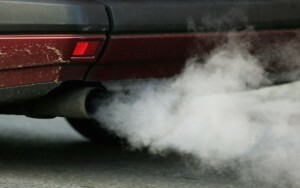 Engines that idle a lot and are only driven in city traffic tend to build up more carbon deposits and sludge. You should change your oil more often to keep engine performance up. Over a year of five minutes of daily idling (which causes incomplete combustion of fuel), it is estimated that the operator of a V-8-engined car will waste 20 gallons of gasoline, which not only produces 440 pounds of carbon dioxide but costs at least $60. Many people allow their cars to idle much longer than 5 minutes sitting at the curb waiting to pick someone up or even in line at take out fast food restaurants. Idling in the Garage Can Kill You. Block Heaters Beat Remote Starters. Remote starters can too easily cause people to warm up their cars for five to 15 minutes, which is generally unnecessary. A block heater, which is designed to heat the engine and can cost under $30, on a timer set to start one to two hours before driving does the trick in very cold climates. Quick Errands Aren’t Quick Enough. We have all seen those people who leave their car running while they run into a store to quickly pick something up or drop off. Leaving your engine running is hard on your pocketbook, produces greenhouse gas emissions and is an invitation to car thieves. One of the problems is that cars idle close to the curb, where pedestrians are walking. And when you have a child in a stroller, they are particularly close to the tailpipe. Studies show that children’s IQ levels are lower when they live near major roads with lots of traffic. i see people allowing their cars and trucks idle all of the time. not only are they wasting gas and money they are fouling the environment around them. they should shut their trucks off.